Although Cleland described the first cases of Chiari malformation in 1883, the disorder is named after Hans Chiari, an Austrian pathologist, who classified Chiari malformations into types I through III in 1891. Chiari's colleague, Julius Arnold, made additional contributions to the definition of Chiari II malformation. In his honor, students of Dr. Arnold later named the type II malformation Arnold-Chiari malformation. Other investigators later added the type IV malformation. It is not at all clear that the 4 types of Chiari malformation represent a disease continuum corresponding to a single disorder. The 4 types (particularly types III and IV) are increasingly believed to have different pathogenesis and share little in common other than their names. Chiari type I malformation is the most common and the least severe of the spectrum, often diagnosed in adulthood. Chiari type II malformation is less common and more severe, almost invariably associated with myelomeningocele. Chiari type III and IV malformations are exceedingly rare and generally incompatible with life and are, therefore, of scant clinical significance. Chiari I: >5mm descent of the caudal tip of cerebellar tonsils past the foramen magnum. Chiari II: brainstem, fourth ventricle, and >5 mm descent of the caudal tip of cerebellar tonsils past the foramen magnum with spina bifida. This article discusses Chiari type I and II malformations with emphasis on the more common Chiari I malformation. T2 hyperintense region on MRI (arrow) depicting edema in central cord region of a patient with Chiari I malformation. Left untreated, this patient is likely to develop cavitation of the edematous central cord, resulting in syringomyelia. CSF hypotension syndrome: Postcontrast MRI before (A) and after (B) treatment with lumbar epidural blood patch. Notice the thick meningeal enhancement (arrows), the relative paucity of CSF in front of the brainstem and behind the cerebellar tonsils, and the engorgement of the pituitary gland before treatment (A). Notice reversal of these abnormalities and ascent of the cerebellar tonsils after treatment (B). In this case, an acquired Chiari malformation was not present, but in some cases it is. Chiari type I malformation is the most common and the least severe of the spectrum, often diagnosed in adulthood. Its hallmark is caudal displacement of peglike cerebellar tonsils below the level of the foramen magnum, a phenomenon variably referred to as congenital tonsillar herniation, tonsillar ectopia, or tonsillar descent. The resultant impaction of the foramen magnum, compression of the cervicomedullary junction by the ectopic tonsils, and interruption of normal flow of cerebrospinal fluid (CSF) through the region produce the clinical syndrome. 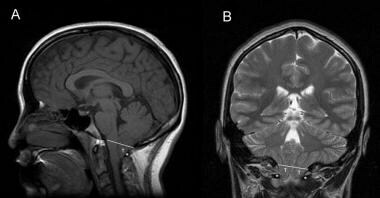 Sagittal and coronal MRI images of Chiari type I malformation. Note descent of cerebellar tonsils (T) below the level of foramen magnum (white line) down to the level of C1 posterior arch (asterisk). Axial MRI image at the level of foramen magnum in Chiari type I malformation. 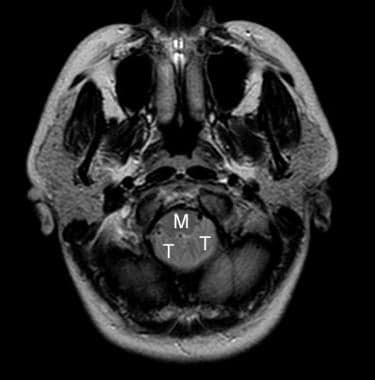 Note crowding of foramen magnum by the ectopic cerebellar tonsils (T) and the medulla (M). Also note the absence of cerebrospinal fluid. Intraoperative photograph of Chiari type 1 malformation showing descent of cerebellar tonsils well below the level of foramen magnum. Chiari type II malformation is less common and more severe, almost invariably associated with myelomeningocele. Because of its greater severity, it becomes symptomatic in infancy or early childhood. Its hallmark is caudal displacement of lower brainstem (medulla, pons, 4th ventricle) through the foramen magnum. Symptoms arise from dysfunction of brainstem and lower cranial nerves. Chiari type III and IV malformations are exceedingly rare and generally incompatible with life and are, therefore, of scant clinical significance. The type III malformation refers to herniation of cerebellum into a high cervical myelomeningocele,  whereas type IV refers to cerebellar agenesis. Importantly, it is not at all clear that the 4 types of Chiari malformation represent a disease continuum corresponding to a single disorder. The 4 types (particularly types III and IV) are increasingly believed to have different pathogenesis and share little in common other than their names. Symptoms of Chiari I develop as a result of 3 pathophysiological consequences of the disordered anatomy: (1) compression of medulla and upper spinal cord, (2) compression of cerebellum, and (3) disruption of CSF flow through foramen magnum. Compression of cord and medulla may result in myelopathy and lower cranial nerve and nuclear dysfunction. Compression of cerebellum may result in ataxia, dysmetria, nystagmus, and dysequilibrium. Disruption of CSF flow through foramen magnum probably accounts for the most common symptom, pain. The pathophysiology of Chiari II is more complex. Although compressive mechanisms likely play a role, as in Chiari I, additional mechanisms may be operative in Chiari II. Stretching of abnormally oriented cranial nerves is believed to play a role. Chiari II may become acutely symptomatic with shunt malfunction, presumably because hydrocephalus further exacerbates the downward displacement of brainstem and stretching of cranial nerves. It has been suggested that irreversible ischemia of brainstem under tension may be responsible for the poorer prognosis of Chiari II after surgery compared with Chiari I. Furthermore, intrinsic neuroembryological abnormalities in Chiari II are widespread and not limited to the posterior fossa (eg, heterotopias, gyral abnormalities, callosal and thalamic abnormalities, in addition to hydrocephalus and myelomeningocele), further complicating the pathophysiology of this disorder. Occipitalization of atlas in a patient with Chiari I. 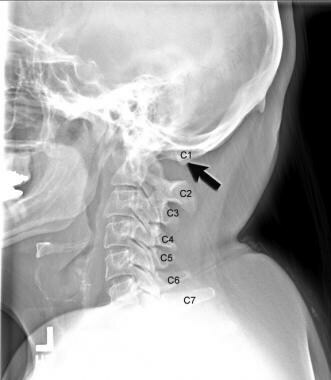 In Chiari I, radiographic presence of tonsillar herniation must correlate with appropriate clinical signs and symptoms before surgical intervention is undertaken. In frankly symptomatic patients, such as those with lower cranial nerve dysfunction, myelopathy, syringomyelia, cerebellar symptoms, or severe post-tussive suboccipital headaches, the decision in favor of surgery is straightforward. Difficulty arises in minimally symptomatic patients or those with equivocal symptoms. CSF flow studies across foramen magnum with phase-contrast cine MRI (see Imaging Studies) may help with surgical decision-making in these cases. 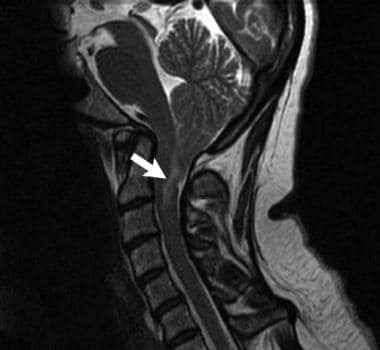 Syringomyelia generally improves or resolves after surgical treatment of Chiari malformation. Rarely is shunting of the Chiari syrinx necessary. Resolution of syringomyelia (asterisk) after decompression of Chiari I malformation (white arrow). Asymptomatic patients without syringomyelia whose Chiari I malformation has been discovered incidentally on MR imaging do not require surgery. In this group, if the radiographic abnormality appears significant, the patient should be educated about the disorder and asked to seek medical care should symptoms develop in the future. In Chiari II, when neurological decompensation occurs, the first order of business is to treat hydrocephalus and rule out shunt malfunction. If evidence of brainstem dysfunction is present in spite of well-treated hydrocephalus and a functioning shunt, surgical decompression of Chiari II is undertaken. The foramen magnum is an oval-shaped opening in the occipital bone, surrounded anteriorly by the clivus, laterally by the occipital condyles, and posteriorly by the squamous portion of the occipital bone. 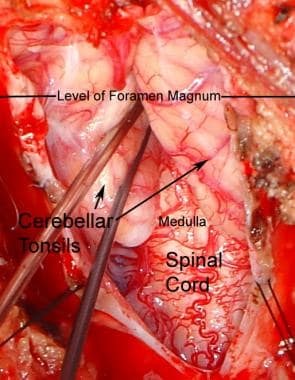 Normally, only the medulla traverses through the foramen magnum and merges seamlessly with the cervical cord. The lower extension of cisterna magna normally forms a large CSF cushion behind the medulla within the foramen magnum. This CSF cushion is replaced by cerebellar tonsils in Chiari I malformation. Anatomical knowledge of the foramen magnum dura and its venous sinuses is of particular importance in surgical treatment. The dura that is applied to the inner surface of the squamous portion of occipital bone funnels abruptly into a cylindrical tube at the level of foramen magnum. The squamous occipital dura is bisected vertically by the cerebellar falx. The depth of cerebellar fax between the cerebellar hemispheres diminishes near the foramen magnum. The occipital sinus runs down from the torcula in the trigone formed by the dural leaflets of cerebellar falx and squamous occipital dura. As it approaches the foramen magnum, the occipital sinus divides into two divergent limbs which course laterally around the foramen magnum to join the sigmoid sinuses or the jugular bulbs. During surgery, dural openings across the foramen magnum are carried out in a Y-shaped fashion in order to avoid the deep part of cerebellar falx and the vertical midline portion of occipital sinus. The two lower limbs of the occipital sinus are transected individually by the two oblique limbs of the Y-shaped incision. Surgical decompression of foramen magnum is contraindicated when tonsillar herniation is caused by etiologies other than Chiari malformation, such as mass lesions in the posterior fossa or CSF hypotension syndrome. Mass lesions in the posterior fossa can result in tonsillar herniation. The correct diagnosis can be missed if tonsillar herniation has been diagnosed by a cervical spine MRI, which has not adequately visualized all of the posterior fossa. Alternatively, if the patient could not have an MRI and the diagnosis has been made with a noncontrast CT or CT-myelography, the mass lesion can be missed. Clearly, treating the tonsillar herniation without addressing the mass lesion would be contraindicated. CSF hypotension syndrome can result in tonsillar herniation. Frequently, these patients complain of headache and neck pain. They may even present with cranial nerve dysfunction, mimicking the symptoms of Chiari malformation. The correct diagnosis can be made with careful attention to the history and radiographic findings. Patients with CSF hypotension syndrome usually present with postural headaches, worse with standing and relieved by rest. MRI shows deflation of the prepontine cistern and sagging of the brainstem against the clivus. Unlike Chiari, the posterior fossa volume is normal. Most dramatically, postcontrast MRI reveals intense dural enhancement throughout the cranium due to venous engorgement, facilitating the diagnosis. Patients with CSF hypotension syndrome are treated with epidural blood patches. If MRI is repeated after clinical improvement, correction of tonsillar ectopia is noted. Greenberg MS. Chiari Malformation. Handbook of Neurosurgery. 6. New york: Thieme; 2006. 103-109. Abd-El-Barr MM, Strong CI, Groff MW. Chiari malformations: diagnosis, treatments and failures. J Neurosurg Sci. 2014 Dec. 58 (4):215-21. [Medline]. Labuda R, Loth F, Slavin K. National Institutes of Health Chiari Research Conference: state of the research and new directions. Neurol Res. 2011 Apr. 33 (3):227-31. [Medline]. Hidalgo J, Dulebohn S. Arnold Chiari Malformation. 2017 Jun. [Medline]. [Full Text]. Koehler PJ. Chiari's description of cerebellar ectopy (1891). With a summary of Cleland's and Arnold's contributions and some early observations on neural-tube defects. J Neurosurg. 1991 Nov. 75(5):823-6. [Medline]. Hofkes SK, Iskandar BJ, Turski PA, Gentry LR, McCue JB, Haughton VM. Differentiation between symptomatic Chiari I malformation and asymptomatic tonsilar ectopia by using cerebrospinal fluid flow imaging: initial estimate of imaging accuracy. Radiology. 2007 Nov. 245(2):532-40. [Medline]. McGirt MJ, Nimjee SM, Fuchs HE, George TM. Relationship of cine phase-contrast magnetic resonance imaging with outcome after decompression for Chiari I malformations. Neurosurgery. 2006 Jul. 59(1):140-6; discussion 140-6. [Medline]. McVige JW, Leonardo J. Neuroimaging and the clinical manifestations of Chiari Malformation Type I (CMI). Curr Pain Headache Rep. 2015 Jun. 19 (6):18. [Medline]. Siasios J, Kapsalaki EZ, Fountas KN. Surgical management of patients with Chiari I malformation. Int J Pediatr. 2012. 2012:640127. [Medline]. Greenberg JK, Yarbrough CK, Radmanesh A, Godzik J, Yu M, Jeffe DB, et al. The Chiari Severity Index: a preoperative grading system for Chiari malformation type 1. Neurosurgery. 2015 Mar. 76 (3):279-85; discussion 285. [Medline]. Pomeraniec IJ, Ksendzovsky A, Awad AJ, Fezeu F, Jane JA Jr. Natural and surgical history of Chiari malformation Type I in the pediatric population. J Neurosurg Pediatr. 2016 Mar. 17 (3):343-52. [Medline]. James HE, Brant A. Treatment of the Chiari malformation with bone decompression without durotomy in children and young adults. Childs Nerv Syst. 2002 May. 18(5):202-6. [Medline]. Perrini P, Benedetto N, Tenenbaum R, Di Lorenzo N. Extra-arachnoidal cranio-cervical decompression for syringomyelia associated with Chiari I malformation in adults: technique assessment. Acta Neurochir (Wien). 2007 Oct. 149(10):1015-22; discussion 1022-3. [Medline]. Guo F, Wang M, Long J, Wang H, Sun H, Yang B, et al. Surgical management of Chiari malformation: analysis of 128 cases. Pediatr Neurosurg. 2007. 43(5):375-81. [Medline]. Wilkinson DA, Johnson K, Garton HJ, Muraszko KM, Maher CO. Trends in surgical treatment of Chiari malformation Type I in the United States. J Neurosurg Pediatr. 2017 Feb. 19 (2):208-216. [Medline]. Ratre S, Yadav N, Yadav YR, Parihar VS, Bajaj J, Kher Y. Endoscopic Management of Arnold-Chiari Malformation Type I with or without Syringomyelia. J Neurol Surg A Cent Eur Neurosurg. 2017 Jun 6. [Medline]. Schuster JM, Zhang F, Norvell DC, Hermsmeyer JT. 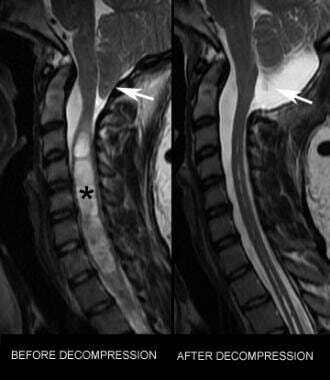 Persistent/recurrent syringomyelia after Chiari decompression-natural history and management strategies: a systematic review. Evid Based Spine Care J. 2013 Oct. 4(2):116-125. [Medline]. [Full Text]. Hoffman CE, Souweidane MM. Cerebrospinal fluid-related complications with autologous duraplasty and arachnoid sparing in type I Chiari malformation. Neurosurgery. 2008 Mar. 62(3 Suppl 1):156-60; discussion 160-1. [Medline]. Spencer R, Leach P. Asymptomatic Chiari Type I malformation: should patients be advised against participation in contact sports?. Br J Neurosurg. 2017 Mar 2. 1-7. [Medline]. Ivashchuk G, Loukas M, Blount JP, Tubbs RS, Oakes WJ. Chiari III malformation: a comprehensive review of this enigmatic anomaly. Childs Nerv Syst. 2015 Aug 9. [Medline]. Chiari Malformation. American Association of Neurological Surgeons. Available at https://www.aans.org/Patients/Neurosurgical-Conditions-and-Treatments/Chiari-Malformation. Accessed: September 27, 2018. Dias M. Myelomeningocoele. Choux M, Di Rocco C, Hockley A, Walker M. Pediatric Neurosurgery. London: Churchill Livingston; 1999. 33-61. Chiari II malformation. Radiopaedia. Available at https://radiopaedia.org/articles/chiari-ii-malformation. Accessed: September 27, 2018. Speer MC, Enterline DS, Mehltretter L, Hammock P, Joseph J, Dickerson M, et al. Chiari type I malformation with or without syringomyelia: prevalence and genetics. J Genet Couns. 2003. 12:297-311. Speer MC, George TM, Enterline DS, Franklin A, Wolpert CM, Milhorat TH. A genetic hypothesis for Chiari I malformation with or without syringomyelia. Neurosurg Focus. 2000 Mar 15. 8(3):E12. [Medline]. Abbott D, Brockmeyer D, Neklason DW, Teerlink C, Cannon-Albright LA. Population-based description of familial clustering of Chiari malformation Type I. J Neurosurg. 2017 Feb 3. 1-6. [Medline]. Boyles AL, Enterline DS, Hammock PH, Siegel DG, Slifer SH, Mehltretter L, et al. Phenotypic definition of Chiari type I malformation coupled with high-density SNP genome screen shows significant evidence for linkage to regions on chromosomes 9 and 15. Am J Med Genet A. 2006 Dec 15. 140(24):2776-85. [Medline]. Milhorat TH, Bolognese PA, Nishikawa M, McDonnell NB, Francomano CA. Syndrome of occipitoatlantoaxial hypermobility, cranial settling, and chiari malformation type I in patients with hereditary disorders of connective tissue. J Neurosurg Spine. 2007 Dec. 7(6):601-9. [Medline]. Deng X, Wang K, Wu L, et al. Asymmetry of tonsillar ectopia, syringomyelia and clinical manifestations in adult Chiari I malformation. Acta Neurochir (Wien). 2014 Jan 22. [Medline]. Tubbs RS, Lyerly MJ, Loukas M, Shoja MM, Oakes WJ. The pediatric Chiari I malformation: a review. Childs Nerv Syst. 2007 Nov. 23(11):1239-50. [Medline]. Langridge B, Phillips E, Choi D. Chiari Malformation Type 1: A Systematic Review of Natural History and Conservative Management. World Neurosurg. 2017 Apr 20. [Medline]. Bolognese PA, Kula RW, Onesti ST. Chiari I malformation and delivery. Surg Neurol Int. 2017. 8:12. [Medline]. James HE. Chiari Malformation Type I. J Neurosurg. 2007 Aug. 107(2):184. [Medline]. CSF flow study with phase-contrast cine MRI. Brain pulsations results in caudad and cephalad flow of CSF across foramen magnum during systole and diastole. The reversal in the direction of flow is picked up by alternating light and dark appearance of CSF in front and behind the medulla and upper spinal cord on phase-contrast cine MRI. In this case of Chiari I malformation, note the complete absence of CSF flow behind (arrowheads) and focal constriction of CSF flow (arrows) in front of cervicomedullary junction. Intraoperative photograph of duraplasty with pericranial graft. The duraplasty provides additional room for cerebellar tonsils at the craniocervical junction, while achieving closure of dura and prevention of cerebrospinal fluid leak.